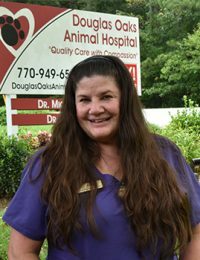 Anne has been with Douglas Oaks since 1996 and has since become known as the clinic jokester. She is always smiling and loves working with our team. Anne enjoys spending time with her Doberman Pinchers on her days off. The trick to a happy home, that includes cats and dogs, is individual time for each pet.